When your screen lights up, so does she. 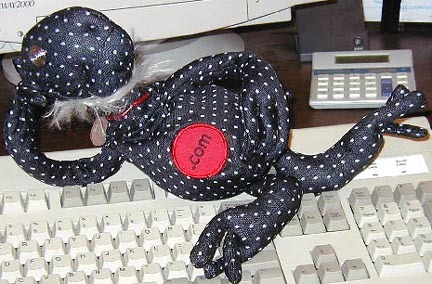 If you've got E-mail in, dotcom knows; she'll alert you by wriggling herself into a better terminal-top reading position. Or, when she senses an exceptional amount of E-action, she'll descend to her desktop trench and place her moveable fingers on your tappable keys. Is the computer a one-man tool? You may think so. dotcom doesn't. Naturally, she thinks every message is addressed to her; her name's on it. So she insists on inserting comments into your replies, forwarding humorous messages to her relatives at other terminals, or ccing to every entry in her copious address book. And when you cruise the net, there she is resting at the end of too many locations, whether you are happy to see her or not. But when it's time to send your own messages, these little annoyances will evaporate in the joy of writing with dotcom. To compose e-mail that is both warm and concise, just install dotcom between keyboard and screen and log in.